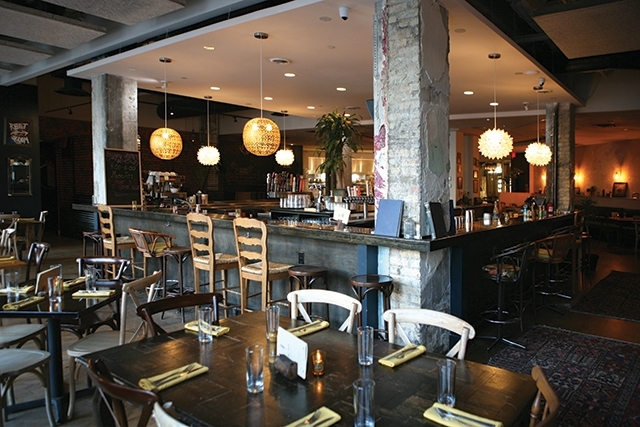 Fig + Farro is a specialty restaurant in Uptown that caters to vegetarian and vegan clientele. It’s not every day you can get me into a restaurant that doesn’t serve meat. Even fewer are the days you’d get me into such an establishment and like, nay, love it. Such was one such day a few weeks back when I had the chance to explore the exotic (for me) cuisine of Uptown’s very own vegan wonderland, Fig + Farro. 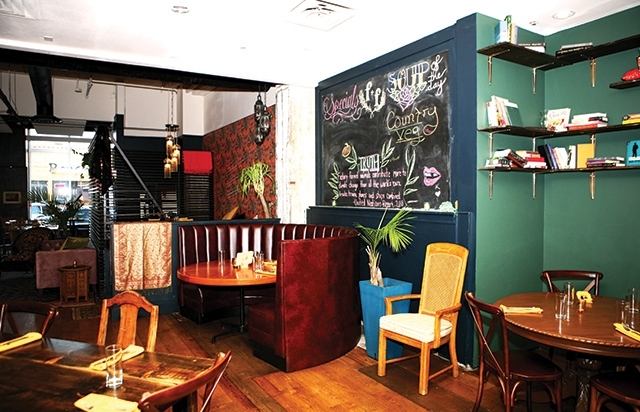 Like many first-time vegan diners, I went into Fig + Farro wondering if I would leave full. I needn’t have worried. And neither should you, dear likely fellow meat eater. The menu is laid out like most: an assortment of small plates, large plates and sides with a variety of cultural and culinary influences that guarantee options for most any taste. Our sumptuous saunter down the menu began with a hefty but delicate falafel. Nestled atop arugula and dotted with tart pomegranate seeds, these crispy orbs are made of hearty yellow peas instead of their more traditional chickpea cousins. A substantial first bite. The fried cauliflower came out next and, while it is considered a side dish, it makes the perfect appetizer. A true table favorite, these crunchy breaded veggie bites are dusted with za’atar and kissed with a creamy preserved citrus tahini. 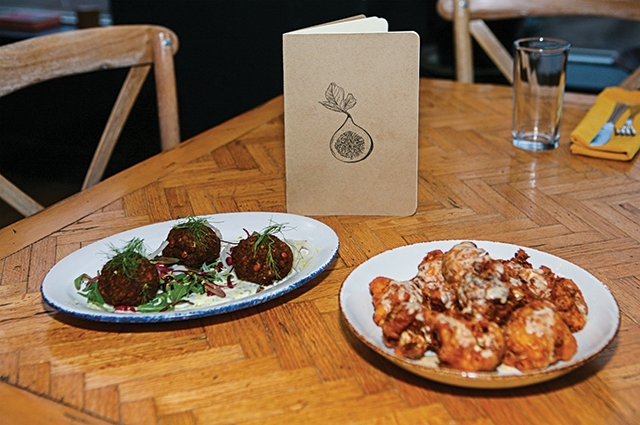 Fig + Farro offers up a cozy environment to complement its healthy menu options. When it comes to large plates and the entree end of things, there are some truly surprising works of edible magic on the menu. If you told me it was possible to create an amazing barbacoa out of… wait for it… jackfruit, I’d most certainly laugh. In fact, I did laugh. On the inside, that is, when I saw it on the menu. Like much of my experience at Fig + Farro, I was more than pleasantly surprised. I have a hard time believing, in fact, anyone would notice the meat in this dish isn’t actually meat. Much less fruit. Piled in all its unctuous glory atop roasted sweet potato, bedazzled with pinto beans, avocado and salsa, this hearty barbacoa was passed around the table wildly. The only thing more surprising than the fruity origins of this dish was the I-can’t-believe-it’s-not-dairy cashew crema that topped it off. The other entree I can’t stop thinking about is the smoked wild mushroom ravioli. Talk about the comfiest of comfort foods. Equally surprising as the barbacoa in its ability to taste like something completely opposite your expectations, this ravioli is veritable voodoo. As in, the ravioli isn’t actually ravioli. The traditional pasta is actually thinly sliced celeriac root. Not that you’ll notice. Yellow pea falafel and fried cauliflower are some of the sumptuous dishes you can have at Fig + Farro. Before your brain has time to work out the math on how slices of vegetable can taste like pasta, it will be slammed with the rich and decadent smoked mushroom and cashew cheese filling. I could’ve easily ordered seconds. I should’ve ordered seconds. By now you know the word “vegan” is no cause for appetite alarm. Pleased you’ll be to learn that desserts at Fig + Farro are equally surprising and satisfying. 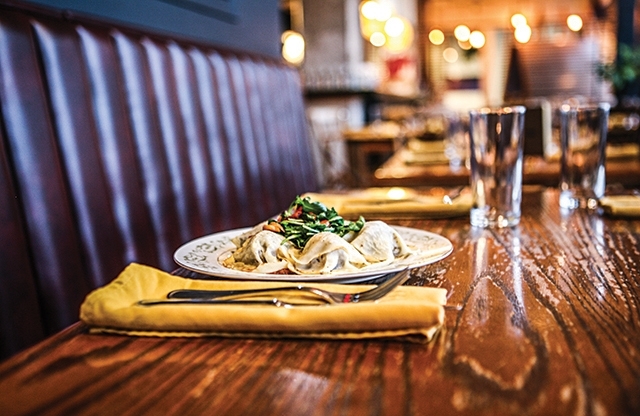 Mushroom Ravioli has you covered. The caramel Tosca cake is the pastry equivalent of a warm, lingering hug. Moist and dense vanilla sponge is festooned with crispy, sweet caramelized almonds. A scoop of locally made vanilla MN Nice Cream accompanies an apple compote that, combined, makes for a happy mouthful. The Suspira de Limeña is a unique and wonderful addition to the dessert menu. 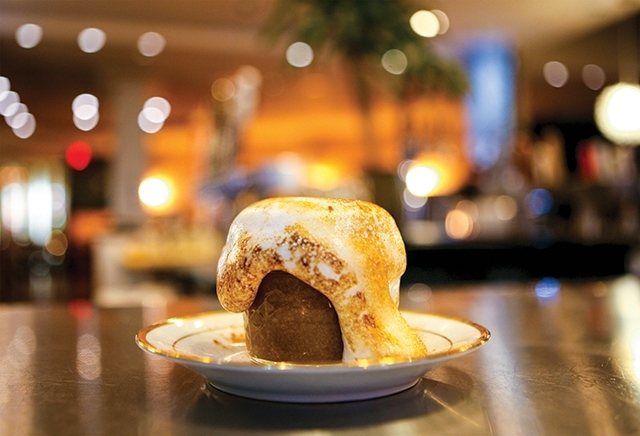 This molten cup of creamy, rich (oh, BTW, totally dairy-free) dulce de leche is topped with a gooey blanket of toasted meringue. If the almond cake was a hug, this is an extended make out session. Pair it with a coffee or boozy latte and you’re golden. dairy-free, such as the Suspiro de Limena. While I’m still likely to seek out meat forward dining experiences, Fig + Farro has taught me I don’t need to. Nor will I walk into a vegan experience henceforth and assume I won’t leave satisfied. If Chef Charlie Baez continues his culinary magic, satisfaction is all but guaranteed.